HARRISON TWP. 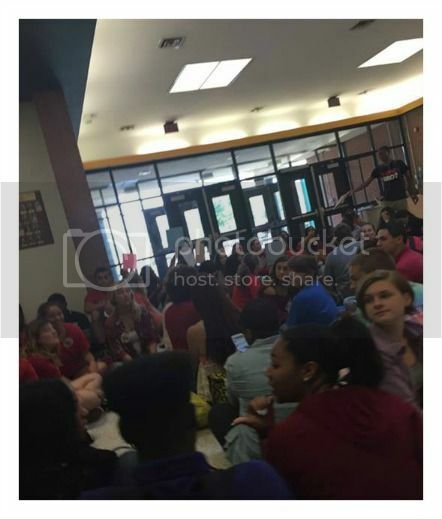 — A group of students upset that their wall display about "Police Brutality" was removed from a wall at Clearview Regional High School Wednesday staged a sit-in in front of the school's main office Thursday morning. The display, put up by students in a humanities class, featured a silhouette of a person with hands in the air, and signs that read "Hands Up! Don't shoot!" School officials said the display was put up without administrative approval and that it happened after school hours. Clearview Regional Superintendent John Horchak III said he was investgating and that disciplinary action might be taken against a teacher, cautioning that such personnel action is generally kept confidential and not released to the press or public.